RAKSHA Automatic Liquid Packaging Machine is widely used for packaging various liquid products such as Water, Juices, Milk, Soya Drink, Ice Cream and other liquid products. The machine is highly recommended to pack in virgin / laminated films. The machine is durable and easy to maintain. It can work for 24 hours if desired. Alternate sizes can be made on order. Sterilizes the water with U.V. Light. 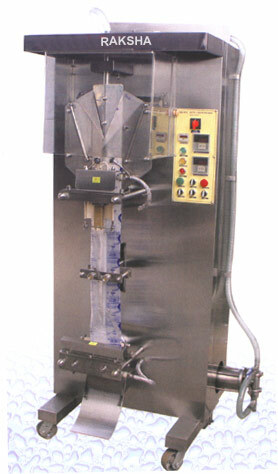 Sterilizes the packing film with U.V. Light. Forms the packing film into Sachets. Drags the packing film in line. Fills the Sachet to required volume. Seals the Sachet vertically and horizontally and drops it. Prints Date of Production, Batch Number and Expiry Date on Sachet. Counts produced number of pouches automatically. Machine stops immediately as packing film roll gets finished. Operator is protected from accident by a safety guards. Wet sealing horizontal copper block is protected against water splash.